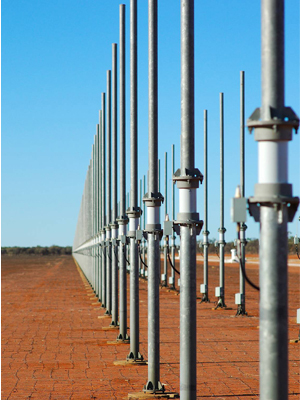 Australia is the world leader in high-frequency, skywave over-the-horizon radar (OTHR) technology. This technology had its beginnings in early research into the ionosphere conducted at Weapons Research Establishment from the 1950s. Subsequently, the Jindalee high frequency OTHR became a core research project from 1970 and was developed to provide surveillance across Australia’s northern sea and air approaches. Unlike traditional radars that were limited by the line of sight, the Jindalee high frequency OTHR conceived and designed by Australian scientists used the ionosphere above the earth’s surface. A high frequency radio signal was beamed skywards from a transmitter and refracted down from the ionosphere to illuminate a target. The echo from the target travelled by a similar path back to a separate receiver site. Received data was processed into real-time tracking information. Developing Jindalee from ‘concept demonstrator’ phase to proven operational capability continued from 1971 to 1987. In 1971, John Strath advocated strongly and successfully for the funding of a scaled-up OTHR prototype. The first experimental radar, designed and built by DSTO (now DST Group), was constructed at Alice Springs in central Australia in the mid-1970s. It later became known as the ‘Stage A’ evaluation program. Jindalee ‘A’, was modestly powered and had a narrow field of detection, a ‘staring’ beam, with a simple whip-antenna array only one-quarter the length of the current Alice Springs Jindalee radar (2.8 kms). But Jindalee ‘A’ did detect aircraft at long ranges and, later, ships. Its radar waveform generator was one of the few pieces of Australian-developed ‘original equipment’ retained in later Jindalee stages. In the early 1980s, Jindalee ‘B’, costing some $30 million, was developed. It was higher-powered, covered at least sixty degrees, had radar track-while-scan capability and an advanced automatic frequency allocation system. It also had an ARO multi-port computer processor — designed in-house and central to signal processing. In 1986, approval was given for the design and development of the OTHR network. This was followed in March 1987 when the federal government launched its Policy Information Paper — The Defence of Australia 1987 — which placed a high priority on establishing a network of OTHRs. It was envisaged that a network of up to three OTHR installations would be constructed covering the approaches of northern Australia. That same year, the operational radar Jindalee ‘C’ was handed over to the Royal Australian Air Force (RAAF). This was achieved at an additional cost of $70 million with the earlier stage re-engineered by BAE Systems (formerly AWA) for the rugged demands of operational life. In 1991, the Commonwealth awarded Telstra (previously Telecom) a prime contract worth $860 million to design and construct the Jindalee Operational Radar Network (JORN). The contract required Australian production of more than 70 per cent of the contract value. Telstra awarded major sub-contracts to GEC Marconi and Telstar Systems, a joint venture between Telstra and Lockheed Martin Corporation. Other significant sub-contracts were awarded to Radio Frequency Systems, Compaq, Eckert Management Group, Fletcher Constructions and the John Holland Construction Group. RLM Management Company, a joint venture of Lockheed Martin and the Tenix Group assumed full management responsibility for the JORN project in 1997. In 1999, the contract to provide JORN to the Commonwealth was novated from Telstra to RLM. Phases 3 and 4 of the fully-fledged Defence network were operationally released to the RAAF and formally accepted in 2003. The domain knowledge within DST was critical in the design, execution and assessment of the intensive testing analysis that was carried out before the formal acceptance. By this time, the new JORN capability consisted of two radars: Radar 1 located in Queensland and Radar 2 located in Western Australia. The original Jindalee radar at Alice Springs continued to be operated as a separate system by the RAAF. The Alice Springs radar was fully integrated into JORN under the Phase 5 project and is now designated as Radar 3. It is used synonymously by 1RSU with the other 2 radars and controlled from an integrated user interface. The JORN network is Australia's first comprehensive land and air early warning system. It not only provides a 24-hour military surveillance of the northern and western approaches to Australia, but also serves a civilian purpose in assisting in detecting illegal entry, smuggling and unlicensed fishing. For public service to defence science. For his work on the Jindalee over-the-horizon radar. For outstanding contribution to science. For his contribution to the Jindalee over-the-horizon radar, particularly its ocean surveillance and meteorological capabilities. For his role as a fundamental player in the development of Jindalee to operational capability. For service to Australian society in defence science. For his exceptional contribution in the transitioning of the Jindalee radar capability into the broader Jindalee Operational Radar Network (JORN) system. For his internationally recognised expertise and inspirational leadership in advancing both Australian and Allied capabilities in Over the Horizon Radar. Recognised by then Minister for Defence Science and Personnel, Warren Snowdon.